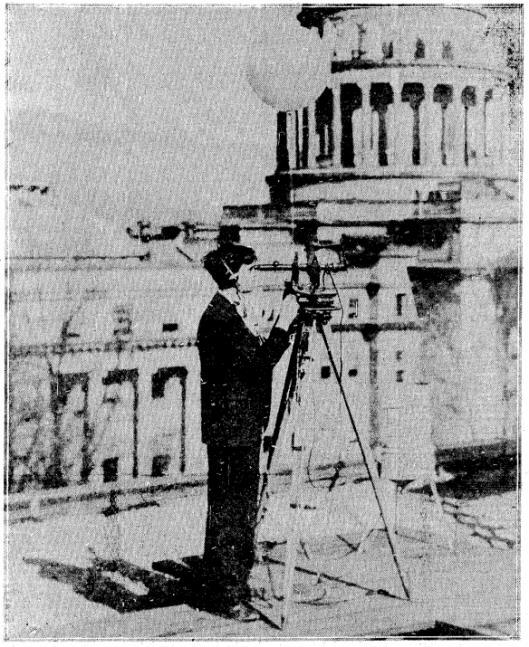 Weather observations began less than a year after the city of Boise was founded in 1863. 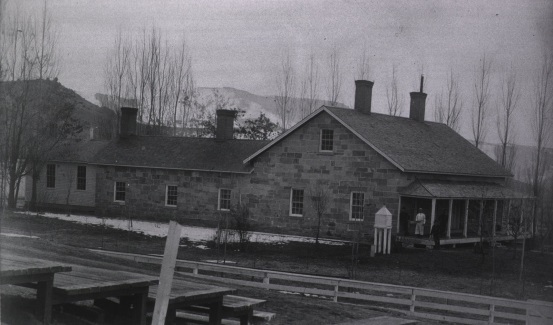 The post surgeon at Fort Boise, renamed Boise Barracks in 1879, began taking observations at the Post Hospital (just north of downtown Boise) on February 1, 1864. This new practice was due to the U.S. Army Medical Department’s belief that there was a possible link between human disease and weather, and required all post doctors to take daily weather observations of temperatures, wind, and precipitation. The observations were taken continuously at the post hospital until November 30, 1898. Post Hospital, built around 1864. The U.S. Signal Service, the predecessor to the National Weather Service, assumed official responsibility for weather observations in the 1870s. The Signal Service took observations in downtown Boise between July 1, 1877 and June 30, 1890 at three different locations: the Overland Hotel, the Davis Building and the Perrault Building. Only the Perrault Building remains today. Budget shortfalls and the belief that other weather observations in the Northwest would be more valuable to forecasters in Washington D.C., led to the closure of the Signal Service station in Boise in 1890. The station was moved to Baker City, Oregon, where it operated until 1949. The U.S. Weather Bureau, now known as the National Weather Service, opened an office in the Sonna Building in downtown Boise on December 1, 1898. Samuel Mudd Blandford, the nephew of the infamous Dr. Samuel Mudd1, was placed in charge of the office and became the first official meteorologist in Boise. In 1904, the office was moved to the fourth floor of the U.S. Federal Building (in front of the Capitol Building). The first weather balloon flight took place from that roof on November 17, 1926. Weather observations were briefly taken at the first Boise airport, now Boise State University, between 1933 and 1939, then moved to Gowen Field in December of 1939. The office later moved from the Boise Airport Terminal to the National Interagency Fire Center in June of 1969, where it remains today. PIBAL Launch at the U.S. Federal Building, May 1931. Photograph Credit: Johnson & Son. Source: The Idaho Statesman (1931). 1Samuel Alexander Mudd was an American physician who was imprisoned for conspiring with John Wilkes Booth in the assassination of U.S. President Abraham Lincoln. 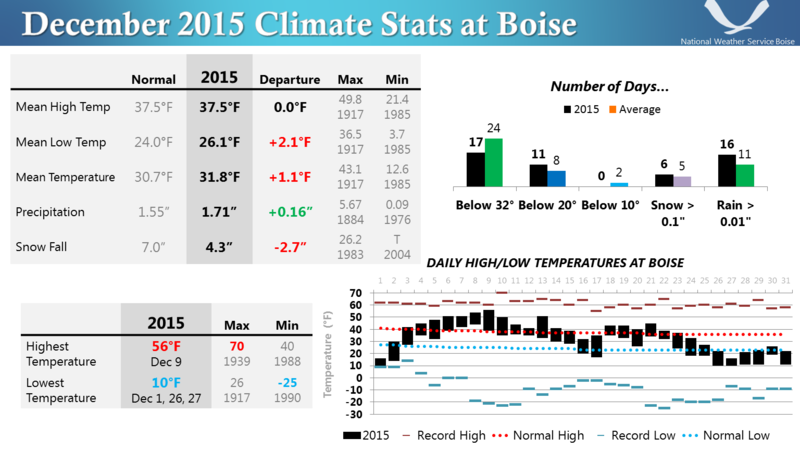 2015 was the 2nd warmest on record at Boise. 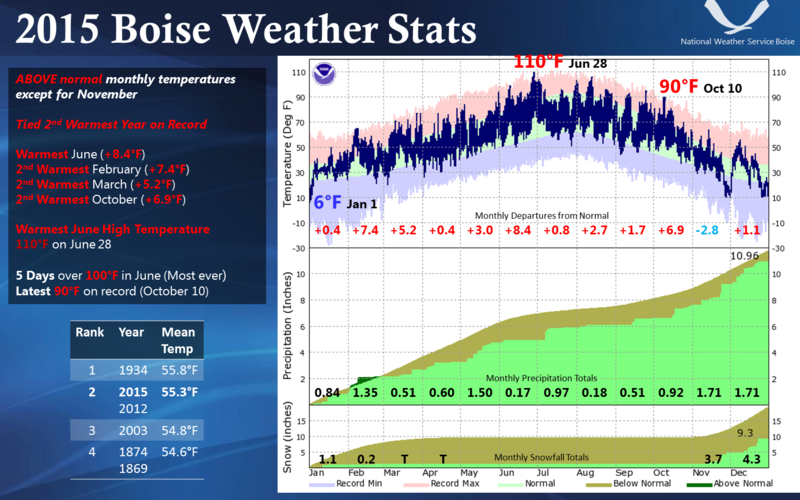 2015 also had the warmest June on record, the warmest June day on record (110°F) and the latest 90 degree day ever recorded at Boise, on October 10th. Despite cold weather during the first couple of days and the last week of the month, the average temperature for December was 1.1 degrees above normal. Abnormally mild weather from the 3rd through the 23rd more than compensated for the two cold spells. Unsettled weather predominated. Precipitation was observed on all but 6 days, with measurable precipitation on 16 days, yet the monthly total was only slightly above normal. What seemed like an endless series of pacific weather systems plowed into the northwest states, dropping most of their rain and snow on the west side of the Cascades. These systems tended to split as they moved inland, sending most of their energy south, further limiting precipitation totals at Boise. But there were a couple of exceptions. The storm on the 7th tapped into subtropical moisture, resulting in around half an inch of rain in the Boise area. On the 13th, a storm with formed off the northwest coast. As it moved inland, a strong cold front and unusually unstable air for this time of year dumped over a third of an inch of precipitation in the form of rain and half an inch of snow. A pattern change which started on the 23rd cut off the flow of moist Pacific air. An upper level trough began to form over the Pacific Northwest coast. As it deepened, it pushed a cold front across the Boise area depositing an inch of snow, enough for a white Christmas. By the 26th, the trough was entrenched over the western states, as far south as southern California and Arizona. Cold air aloft with fresh snow cover and clearing skies provided ideal conditions for radiational cooling, filling the Treasure Valley with cold stagnant air. By the 27th, a temperature inversion had been created as a warm upper level ridge built over the area.